Much more than just painting demonstrations! In "Achieving Luminosity with Transparent Watercolor," Jim Kosvanec offers the serious watercolor painter an information based video series complete with diagramed discussions, practical exercises and arresting demonstrations. 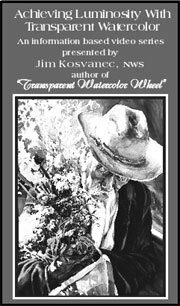 Easy to understand, this series is an indispensable learning tool for all watercolorists, regardless of personal style or level of accomplishment. Presented in a one-on-one format, these videos provide a personal Jim Kosvanec workshop experience in the comfort and convenience of your own home! Print this form and send via mail or call M-F (805) 528-2244 or Fax to 805-528-2233 - Visa & Mastercard accepted. payable to Jim Kosvanec. Allow 2-3 weeks delivery.